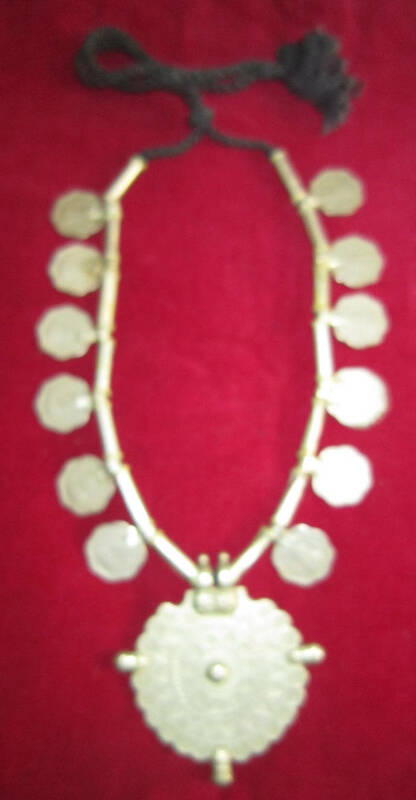 Authentic Vintage Necklace from the the Nomadic tribal group of India called the Banjaras. This necklace is absolutely Stunning and looks unique and dramatic ! With authentic vintage coins and a gorgeous Medallion pendant . These unique necklaces are quite old and may show signs of wear. But that adds to their authenticity and appeal ! A MUST HAVE for belly dance costumes and Gypsy themes. BANJARAS are gypsys or nomadic people of North Indian origin. Over the course of the last few centuries, the Banjara have spread throughout Central and Southern India. The Banjara women have a colorful and distinct style of dressing that sets them apart from other tribal groups of India. They are elaborately embroidered with colorful threads and little mirrors. Their jewelry is heavy and is often adorned with cowrie shells which are considered very auspicious, real coins, metal bits etc which make it very unique and vibrant.